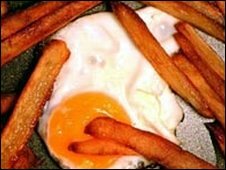 Eating fatty foods can help boost memory, a US study suggests. A team at the University of California, Irvine discovered oleic acids from fats were converted into a memory-enhancing agent in the gut. They hope their work, published in Proceedings of the National Academy of Sciences, could offer a new way to treat memory-related problems. Drugs to mimic the action of the compound are in trials for controlling the dangerous fat triglyceride. Evidence shows high levels of oleoylethanolamide or OEA can reduce appetite, produce weight loss and lower blood cholesterol as well as triglyceride levels, making it an attractive candidate as a diet pill too. Dr Daniele Piomelli and his team discovered that OEA also causes memories to be laid down by activating memory-enhancing signals in the amygdala - the part of the brain involved with memories of emotional events. When they gave OEA to rats, it improved their memory retention in two different tests - running in a maze and avoiding an unpleasant experience. And when they blocked OEA with a drug, their performance on the tasks declined. Dr Piomelli said there was an evolutionary explanation for this role of OEA. He said: "By helping mammals remember where and when they have eaten a fatty meal, OEA's memory-enhancing activity seems to have been an important evolutionary tool for early humans and other animals. But he said this might not always be helpful. While OEA contributes to feelings of fullness after a meal, it could also engender long-term cravings for fatty foods that, when eaten in excess, can cause obesity. Rebecca Wood, chief executive of the Alzheimer's Research Trust, said: "This is fascinating research and advances our understanding of the impact that diet can have on brain activity. "When thinking about what constitutes a healthy diet, usually what's good for the heart is also good for the head. "While this research suggests that fatty foods could help in the formation of longer term memories, a healthy balanced diet is still the best advice for reducing the risk of developing dementia. "Better understanding of how memories are formed could lead to new treatments that help the brain when it becomes affected by Alzheimer's." Professor Harald Hansen, of The Danish University of Pharmaceutical Sciences, in Copenhagen, has been studying OEA's anti-obesity properties. He said: "Clariyfing the role of OEA in human food consumption will add to our understanding of the development of the obesity epidemic. Such knowledge may possibly also help us develop drug candidates for treating morbid obesity." But he pointed out that OEA was not commercially available for human consumption and it had not yet been documented that it would have the same effects in humans as was seen in rats.